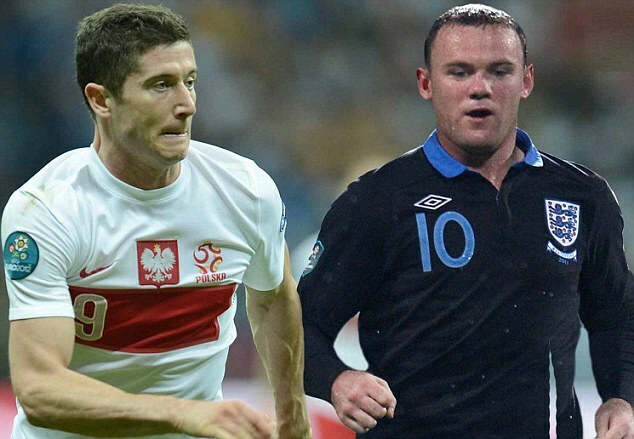 The national soccer team for England will play against Poland on Tuesday October 15, 2013 (15/10/2013) for World Cup Qualifying - UEFA at 3:00 PM (New York time). At this moment England has an official FIFA ranking of 17, and Poland is 65 in world ranking. England (4-2-3-1): Hart; Baines, Jagielka, Cahill, Jones; Gerrard, Lampard; Welbeck, Rooney, Townsend; Sturridge. Poland (4-2-3-1): Boruc; Wojtkowiak, Glik, Wasilewski, Jedrzejczyk, Sobota, M. Lewandowski; Klich, Krychowiak, Blaszczykowski; R. Lewandowski. While England were able to put away Montenegro 4-1 at Wembley on Friday evening in a game which saw youth come to the fore, with a star-performance from debutant winger Andros Townsend, Poland succumbed to a 1-0 loss to Ukraine which put an end to their hopes of making it to Brazil. Poland have travelled very poorly this campaign, in what is expected to be Waldemar Fornalik's final game in charge. Anyway, they might perform better in a relaxed fashion and they do have players that can cause damage. Of course, England's last positive result will count for nought should they fail to beat Poland on Tuesday evening. Ukraine (who play San Marino in their final match – an assured three points) beat the Poles 1-0 in Kiev to stay just a point behind England. Roy Hodgson is expected to be without the injured duo Ashley Cole and Tom Cleverley, while Kyle Walker is unavailable having received a yellow card in the 4-1 thumping of Montenegro last friday night, so either Phil Jones or Chris Smalling will come in to provide cover. Leighton Baines will continue at left-back. Man of the Match Andros Townsend should be rewarded having impressed on his debut with a place in the starting lineup and we should also see both Wayne Rooney and Daniel Sturridge lead the attack up front. As for the Polish side, they are without a number of key players, the most significant of being Borussia Dortmund full-back Lukasz Piszcek, Sampdoria defender Bartosz Salamon and their promising young left-winger Maciej Rybus. Furthermore, Marcin Wasilewski may come in for Szukala (suspended).